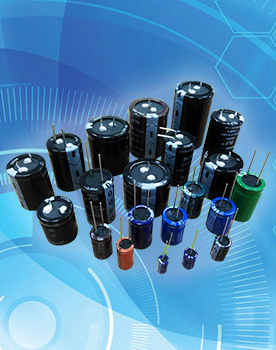 An electrolytic capacitor (e-caps) are polarized capacitors whose anode (+) is made of a particular metal on which an insulating oxide layer forms by anodization, acting as the dielectric of the electrolytic capacitor. A non-solid or solid electrolyte which covers the surface of the oxide layer in principle serves as the second electrode (cathode) (-) of the capacitor. Due to their very thin dielectric oxide layer and enlarged anode surface, electrolytic capacitors have—based on the volume—a much higher capacitance-voltage (CV) product compared to ceramic capacitors or film capacitors, but a much smaller CV value than electrochemical supercapacitors.